Synopsis: Seven year old Grace always dreamt of becoming a guardian angel, like those who guarded and guided her people and prepared to bravely fight in the dreaded mythical event, the Crystal Shade – which never came. It’s not like Grace ever wanted to see Demons. Or wants to know what evil and darkness is – things that no one ever faced on her world and, as the legends say, the Crystal Shade carries within – nor does she want to die to be reborn as a guardian. But, she thinks the mysterious life of angels is so noble, a fable that it sounds exciting – until it actually happens. 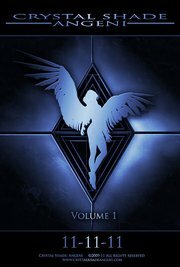 Crystal Shade: Angeni, Volume 1, explores the early life of a young daydreaming soul who is destined to reveal the forgotten past of her home world and to seek the answer for the eternal question: what the legendary Crystal Shade really is. Istvan Szabo was extremely gracious in allowing me a sneak peek of his upcoming novel, Crystal Shade, co-authored by Orlanda Szabo, and I must say, I’m very interested. The novel opens with an elderly man reminiscing about his past, thinking of the past wars and the crystals that have come to mean so much to him. He seems to live very much in his past, speaking aloud to his memories, and one, about the a beautiful girl, especially haunts him. He is interrupted in his musing by two young children, children that remind him of someone he knew long ago, and, after a little coaxing, he begins to tell them the story of Grace and the Crystal Shade. The story he begins to tell is extremely interesting, and I found myself captivated by the world Szabo creates in his novel. It is a unique world complete with a sapphire sun, winged guardians, goddesses, and even mechanical birds as transportation. Though I was only allowed to read the first 70 pages or so of the first volume, the novel really whet my appetite for more, and I am excitedly awaiting the release of the full novel on November 11, 2011. For more information, check out the websites below, and don’t forget to add Crystal Shade to your list of books to read!